The change to a patient-centered medical home model enabled one internist to practice medicine to his fullest extent. The extra income and relaxed atmosphere are added benefits. Editor's Note: Dr. Ejnes is Chair, ACP Board of Regents, 2011-2012, and is guest-writing this month's President's Message. Over the past several years, I've spoken to ACP members and the media about the future of primary care and small internal medicine practices, using words such as “collapse,” “crisis,” and “threatened.” As I end my year as Chair of ACP's Board of Regents, my outlook for primary care and private practice is more positive, based on observations “on the ground,” including some of my own experiences of the past several months. I have been in private practice since 1990, starting in a two-internist practice. In 1995, my practice merged with five other small practices into what is now a physician-owned group with over 90 physicians in small offices throughout Rhode Island. Most of my income comes from fee-for-service payments. When I'm not away on ACP business, I am in my office with five other internists, seeing 20 to 22 patients a day, returning phone calls, filling out forms, paying rent and salaries, dealing with prior authorizations, e-prescribing since 2003, and using an electronic health record (EHR) since 2006, just like many of our members. Why the recent change in view? In late 2010, my practice began its transformation into a patient-centered medical home (PCMH). We achieved Level 3 PCMH recognition from the National Committee for Quality Assurance and in January 2011 entered a contract with one of our commercial insurers that supports our PCMH along the lines recommended in ACP's 2006 position paper on the “advanced medical home.” In addition to enhanced fee-for-service payments, we receive a monthly risk-adjusted management fee, performance-based payments, and support for the hiring of a nurse care manager in our office. Our practice's transformation increased our staff's role in taking care of our patients and reduced the time that I spend doing things that other members of the team are trained to do. For example, we use our EHR to identify patients who are overdue for recommended vaccines and our medical assistants make sure that they get them. The medical assistants reconcile drug lists and screen patients for fall risk. I regularly receive feedback on my patients' diabetes or blood pressure control, using data from our EHR (as opposed to claims data), with one report that covers all of my patients, regardless of payer. Our nurse care manager meets with my diabetic, obese and hypertensive patients to educate and counsel them on lifestyle change in ways that I could not achieve under the traditional payment and delivery model. All of this leaves me with more time to do the things that only a physician can do. My practice income is up, and despite what seems like added work, I feel less hassled and more relaxed in the office. And we're just getting started. I realize that much of what I described is not achievable by small practices that lack the infrastructure and resources that my practice developed over the past 16 years. In 1995, my then three-person practice was in the same position as many of today's small practices. At that time, hospitals were buying practices, a new payment model was approaching (capitation), and small practices were threatened with extinction, not unlike the situation today. Our response was to join forces with like-minded physicians to allow us to maintain a significant degree of independence and enable us to participate in new payment models. Forming this larger physician-owned group required us to give up some autonomy but kept us independent of hospitals, insurance companies and large corporations. Merging practices isn't the only way for small practices to survive. 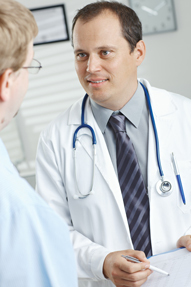 In my travels, I have spoken to physicians who are in solo practice and doing well. While still “on their own,” they are working with other small practices by joining independent practice associations (IPAs). This gives these solo and small-practice physicians access to new payment models, such as PCMHs and accountable care organizations, that would otherwise be beyond their reach. Such arrangements also offer resources that facilitate team-based and coordinated care, help with EHR acquisition and maintenance and assistance with practice transformation. Although a merged group practice has some advantages that an IPA lacks, the IPA structure allows these small-practice internists to remain independent in a changing practice environment. These internists can continue to own their offices, choose their own staff, set their own hours, and control their practice checkbooks. I believe that there is a future for small practices, if they are willing to adapt. What is possible and what will work will depend on geography, the local hospital and payer environment, and the local physician culture, to list a few factors. As someone who participated in the development of ACP's policies on health reform, health information technology and the PCMH, I think it is fitting that I am now living with the “real life” application of these policies. The College's leadership and staff realize that our members in small practice will need significant support to be able to move forward and take advantage of the brighter future that I described. Some of the needed programs, products, and services already exist, such as Medical Home Builder 2.0 and AmericanEHR Partners, while others are under development. The challenge will be for each of us to decide how much of our isolation and autonomy we are willing to trade in for the opportunity to remain independent and physician owned. That may sound contradictory, but it is not, as I hope that I have shown.